At Cody’s Appliance Repair, we’re experts at Kelvinator Repair. Our technicians are fully background and drug screened for your safety and peace of mind. Our technician will arrive in a fully stocked service vehicle, prepared to handle your Kelvinator appliance repair. Customer satisfaction is our top priority; let us know how we can help you with your Kelvinator appliance. Cody’s Appliance Repair has had years of experience with the old Kelvinators. Whenever possible, we recommend choosing Kelvinator repair over replacement. Vintage appliances add character to your home, and they come with years of history and memories. Don’t get rid of your old Kelvinator appliance; call Cody’s Appliance Repair, and we’ll get your Kelvinator up and running in no time. Some folks just like the vintage stuff, and we are here to help! Kelvinator was founded in 1914, in Detroit, Michigan, by engineer Nathaniel B. Wales who introduced his idea for a practical electric refrigeration unit for the home. In February 1916, the name of the company was changed to “Kelvinator Company” in honor of British physicist, Lord Kelvin, the discoverer of absolute zero. 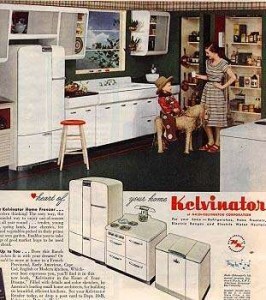 Kelvinator was among some two dozen home refrigerators introduced to the US market in 1916. In 1918 Kelvinator introduced the first refrigerator with any type of automatic control. This brand is no longer produced for the US market, but if you live in Argentina, you are in luck! Need Kelvinator Repair in Boise, Eagle, Meridian, Nampa, Caldwell, Star, Middleton, Garden City, Emmett, Kuna or Horse Shoe Bend? Call us at (208)938-1066, or request service right here from our website. Let our family help your family!